All of us need a tankless heater to lower our energy bills. For, as suggested by numerous reports, tankless heaters only sniff energy when compared with their traditional, storage water heaters. That said, not all tankless heaters are created equal, meaning your energy bills might not reduce if you choose a faulty tankless water heater. It is where the EcoSmart ECO 27 Electric Tankless Water Heater comes into play. Being the Best Seller on Amazon, the EcoSmart ECO 27 is known to save up to 50% on your water heating costs thanks to its copper and stainless steel components using which it converts maximum energy into heat. And though you haven’t asked for it, yet, the EcoSmart ECO 27 Electric Tankless Water Heater is extra-compact, meaning it won’t consume much space in your home. Encouraged by the early signs coming out of EcoSmart ECO 27? Want to know more about it? You need to go only one way. 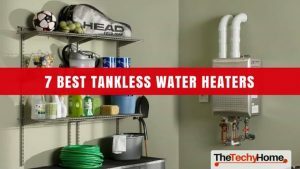 As stated above, not all tankless water heaters are created equal. So, you might ask: what differentiates the EcoSmart ECO 27 from the riffraff? You guessed it: its features. Let’s take a look at some of the most important of them. 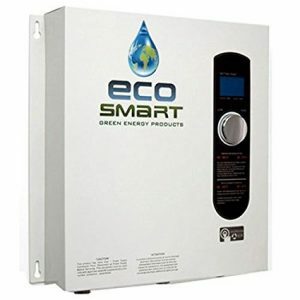 Thanks to the fact that it is electricity powered, the EcoSmart ECO 27 is a cinch to install. This feature of this heater is in stark contrast to its gas-powered counterparts which takes hours and expert advice just to get running. Why is it so, I hear you ask? Lack of venting. Yes, while gas powered heaters require you to provide adequate venting options, a fitting gas line size, and a fresh air supply, all this heater demands of you is ample storage space and a stable electricity supply. Give it what it needs, and you won’t have to wait a moment to turn it ON. That said, as suggested in the instruction manual of this heater, you should still hire an electrician to get this heater running. For, even if you think you know everything, the lifetime warranty provided on this heater won’t cover damages caused by user’s negligence, hence it is better for you to be safe now than to be sorry later on. Go through the instruction manual of the EcoSmart ECO 27, and you’d know this heater requires extremely small effort from your side to keep functioning. Why? Two important features play a role in this regard. 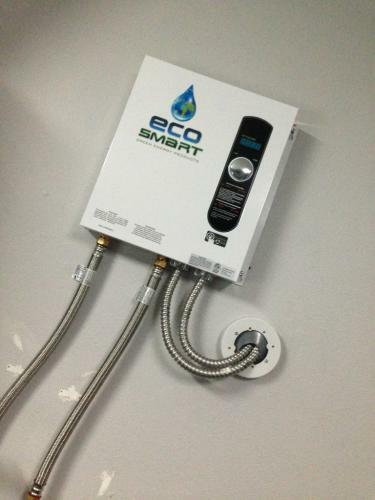 First, unlike cheap tankless water heaters, the EcoSmart ECO 27 has used copper and stainless steel components. In addition to boosting better conductivity, both these materials provide a better resistance to rust. As a result, the pipes inside the heater will remain secure from the effects of dust, debris or any other unwanted materials which may come alongside fresh water supply. Second, though the parts of this heater enjoy a lifetime warranty – meaning you have virtually nothing to lose if you decide to go for this heater, they are easy to replace. Hence, provided if one of these parts goes rogue, you won’t have any trouble looking for an alternative. Hence, if your previous heater forced you to consult your local plumber time and again during its running season, this heater will make sure the number of your plumber goes down your phone call log. 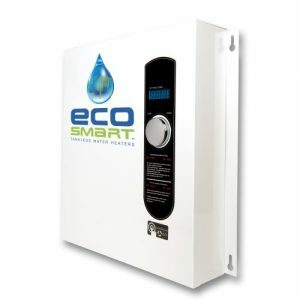 Talking about tankless water heaters, EcoSmart has produced six electric models for both commercial and residential uses. They include ECO 8, ECO 11, ECO 18, ECO 24, ECO 27, and ECO 36, with all of the products rated based on the kW they draw from your house. Excluding the ECO 36 – which is super expensive, the 6GPM flow rate provided by the EcoSmart ECO 27 is the highest of any other EcoSmart heater. Put simply, the 6GPM flow rate means that this heater is capable of supplying hot water to four showers and one sink in warmer, southern climates. However, provided you live in a colder climate region, the water flow rate provided by this heater drops down to 3GPM at a temperature as low as 37*F, meaning two showers can still draw water from it at the same time. Hence, whether you live in chilly conditions or moderate climate regions, the EcoSmart ECO 27 has got something to offer. Even when they aren’t as good as the EcoSmart ECO 27, tankless water heaters are known to draw less energy than their traditional counterparts. However, since this heater is the best-selling tankless heater on Amazon, it means it has got something which other tankless heaters haven’t. What is it, I hear you ask? Well, it is the self-modulating technology with which this heater is equipped which separates it from the riffraff. As implied by its name, this technology modulates the heater based on two factors: your demand and the outside temperature. For example, let’s say it is hot out there and your hot water demand has got down. In such a scenario, the self-modulating technology would put the heater on a hibernating mode. Consequently, the heater would be drawing less energy to reduce your energy bills. Conversely, even if your hot water usage is high and the temperature out there is freezing, the self-modulating technology would make sure the heater doesn’t use excess energy for its heating requirements. Consequently, even when the heater is operating at its peak performance, it won’t be using as much energy as a conventional tankless water heater. If not tampered with, the jumpers are designed to limit the output water temperature to 105*F, a safe limit. Consequently, even when you aren’t at home – the elderly and young children can operate this heater without any concerns for their safety. Gone are the days when you had to turn a knob and hope that it is working so that you get hot water when in the shower. 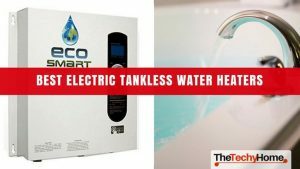 As is the case with the EcoSmart ECO 27 Electric Tankless water heater, the best heaters give temperature controls, hence resulting in better accuracy. What’s more, to give you cruise control over this heater, EcoSmart have provided it with 1-degree increments while setting the output water temperature. As suggested by the high flowrate provided by the heater, it won’t operate on ordinary electrical wiring. Rather, it would require wires capable of transmitting 240V transmitting round the clock. Hence, if you haven’t used tankless heater before, you may have to upgrade the electrical wiring of your house. If you live with your family – or has huge hot water requirements in winter, but don’t want to amp up your energy bills while meeting them, you need the EcoSmart ECO 27 Electric Tankless Water Heater. Not only will it consume less energy but it would also require less maintenance while being safe to use even if you have children and elderly at home.